The Garden Coop walk-in chicken coop plans give you the foundation — and the freedom — to build the perfect chicken coop for your backyard flock. Whether you're new to chickens or to building, these plans get you closer to raising your own farm-fresh eggs, without turning your backyard into a barnyard. » Written for beginners. This 45-page e-book includes a detailed tools and materials list, measurements, photos, diagrams, and step-by-step instructions to show you how to build a coop that you (and your chickens. . . and neighbors) will love. » Comes with email support, directly from the designer. The Garden Coop is an original, proven design that's been built by backyard chicken keepers around the world since 2008. So when you set out with these plans, you not only get responsive, email support from the designer, but you also enjoy the benefit of the collective knowledge, ideas, and examples from The Garden Coop community of builders. SIZE: The outer dimensions of The Garden Coop measure about 10'w x 6'd x 8'h. (You also want to leave about 2-3 feet of working space on all sides.) Inside, the run offers about 50 square feet of space. The henhouse offers 15 square feet, including room for a couple roosts and a double nest box, the instructions for which are included in the plan. You can build exterior nest boxes with our free online plans, the link to which you'll find in your eBook. COST AND MATERIALS: The coop is made primarily of lumber, hardware cloth, polycarbonate roofing, the siding of your choice, and the hardware to bring it all together. Purchased new, these materials should run you roughly $750-850 USD, pre-tax. A complete materials list is in the plan. 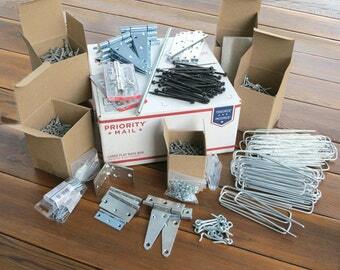 Also, see our other listings for a pre-packaged hardware quick kit. TIME TO BUILD: About 2-3 weekends, if you're working mostly alone. But it's even more fun to build with a partner and/or kids! CLIMATE: You'll find The Garden Coop at home just about everywhere — from sunny Florida, Australia, and Texas to chilly Wisconsin, Alaska, Germany, and even the Rockies (at an altitude of 7,000 feet!). That's because what chickens need most of all is proper ventilation and fresh air. In the winter, the henhouse section of The Garden Coop offers refuge from the bitterest cold, and it's designed so that you can easily add insulation, windows, electric heat, or whatever your climate demands. More questions? Please convo me anytime! The plans were a great way to start the planning for our coop. We adapted our design to fit our needs but couldn’t have done it as quickly or as well without the plans. Definitely worth it! Well written plans. Can’t wait to start our new coop! 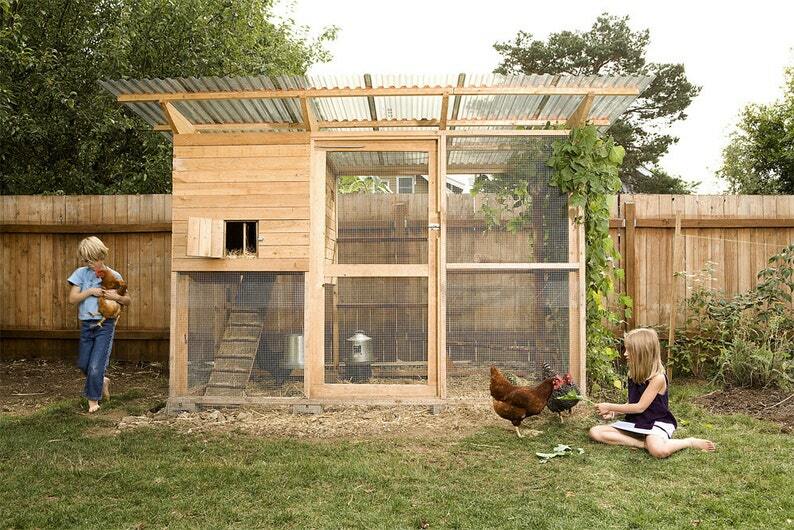 We want you to have the best chicken coop and accessories for you and your chickens. If you are not completely satisfied, let us know within 30 days, and we will fix any issues or refund your money, less any shipping costs included in the initial price. Email us at info@thegardencoop.com for more details and to request a refund. It is your responsibility to make sure that any project you undertake is safe, effective, and legal for your situation. Our plans are offered AS IS for information and entertainment purposes only. The Garden Coop LLC makes no warranties or representations of any kind concerning the accuracy, suitability, or safety of the information contained on the site or in the plans. By using the information or ordering our plans and products you expressly acknowledge having read and understood this disclaimer and the waivers contained in it, and you agree to hold The Garden Coop LLC, its owners, employees, and agents or anyone else who has been involved in the creation, production, or delivery of this site or the plans harmless from any damages or injuries of any kind to you or any person that might result from your use of or reliance upon the information or from any errors, omissions, or other causes. Make sure to follow all manufacturers’ instructions when using tools, materials, or equipment—and use the appropriate protective devices when building, such as workgloves, eye and ear protection, boots, etc. Know what you can handle physically as well, and work within your limits.